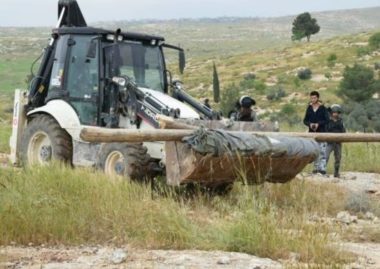 Israeli soldiers invaded, on Tuesday morning, the village of Susiya, south of Hebron in southern West Bank, and demolished two tents. Rateb Jabour, the coordinator of the National and Popular Committees against the Annexation Wall and colonies in southern West Bank, said the soldiers surrounded the small village before invading it. He added that the soldiers demolished a residential tent, owned by Hussein Nawaj’a, housing ten family members, and another tent, which was used as a barn. Jabour stated that the army has been carrying out frequent violations against the Palestinians and their property, as parts of its ongoing attempt to displace the resident and expand the illegal Susya colony, which was built on Palestinian lands.